Speaker of the House of Representatives, Hon Yakubu Dogara, has said that unless interest rates on loans in Nigeria are reduced to make funds accessible to more Nigerians with investible ideas, the nation’s economy will continue to rely on investors from other countries to make it grow. Speaking at a briefing on Economic Recovery and Growth Plan (EGRP) by the Federal government’s economic team led by the Minister of National Planning at the National Assembly, Speaker Dogara said the government must ensure that more Nigerians dominate the economic sector to propel growth, lamenting that the present situation where Nigeria has to source funds from foreigners to push national projects and create job opportunities is undesirable and must be addressed by encouraging more economic activities through availability of funds. He said, “Granted the way the Nigerian economy is structured and organised, is it possible for people who have investible ideas to have access to funds to be able to invest, or do we continue to rely on monies flowing in from other jurisdictions to our country? ‘The cost of funds in Nigeria is too high. What can we do about this? Honestly speaking, if the young people who are leaving university each year will be able to access funds at single digits, some of them may not even bother about the jobs that we are talking about. They will be able to pursue ideas and dreams that they have and those dreams may lead to generation of the jobs that others are seeking. “I have said this over and over again, what is it that we can do as a government to bring down interest rates in this country so that people can access these funds and develop the economy? I do not know where we are going to get 404 billion dollars from, for instance, in Nigeria, I don’t know where. I don’t even know if we can raise 12 billion dollars from private sector in this country, except we rely on outsiders. But the point is that we should dominate the space ourselves and the only way we can do that is to bring down interest rates. I do not know how we can escalate this discussion or in what manner we can achieve this, but it is something we cannot run away from". He went further to commend the executive for carrying the legislature along in its initiatives aimed at revamping the economy, while reiterating that the National Assembly will continue to partner the executive to seek ways and means to improve the economy, including how to put capital in the hands of Nigerians to create wealth and attain their dreams and aspiration. 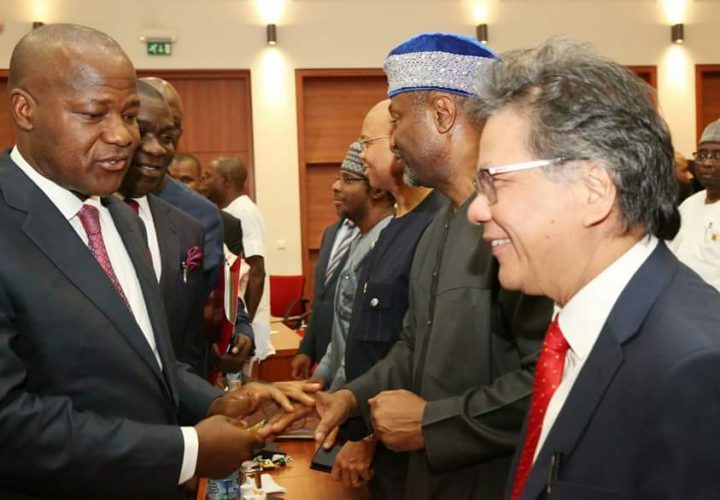 Hon Dogara also noted that for the first time, “we have a body consisting of the executive and the legislature working together on the ease of doing business and in this parliament, there were times we passed laws within the space of a month and I said we have turned to a particular parliament, I don’t want to mention the name, that can pass a law within hours but it is just because we are interested in working together to deliver the promise of democracy to our people, which is life, liberty and the pursuit of happiness". The speaker expressed optimism that the plan of the executive will be fully implemented, saying that Nigeria has never been short of ideas and visions to move forward but has been held back by lack of implementation of the many ideas that were conceptualised. “In Nigeria, we have never lacked vision, we have had people who have seen vision 2020, so many development plans have been drawn but the problem has been implementation and all of us gave the charge to the minister that it wasn’t just enough to conceptualise this vision on paper but at least we must have a statement that will lead to the implementation of this wonderful plan and I am happy that today we are talking about the implementation of the plan and we have a very smart team that has decided that we shouldn’t just learn from experience by trying our hands on so many things and then we only learn when we get our fingers burnt, but that we have decided that we will learn from the experience of others,” he stated.